According to sources and latest updates it is certain that the Punjab State Government is all set to launch the loan waiver scheme within the state. Latest updates also state that the state government aims at implementing the new loan waivers scheme for marginal and small farmers within the state. The new loan waiver scheme was announced by the State’s Chief Minister Capt. Amarinder Singh in a cabinet meeting in June 2017. The state government has also stated that the new scheme to be launched shall be headed under the supervision of the Deputy Commission’s in each district within the state. The state government aims at waiving off crop loan amount for small and marginal farmers in the state with the implementation of the Yojana. It is also certain that the state government has announced waiving off the entire interest amount that is outstanding for the farmer’s since April 2017 till the current date of implementation. It is certain that over 10.25 lakhs state farmers (marginal and small) will be benefitted once the new scheme has been implemented in the state of Punjab. The state government has already made it very clear that full crop loan amount for marginal farmers with Rs 2 lakh loan liability will be waived off completely once the scheme has been implemented. 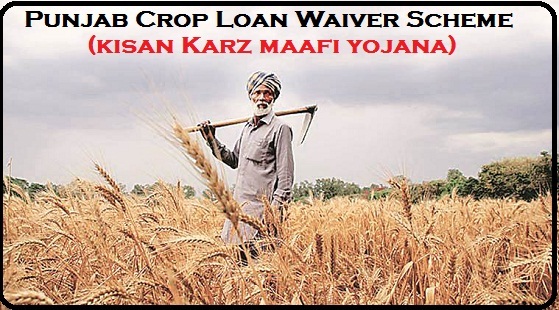 In case of small farmers a loan amount of Rs 2 lakhs from the crop loan will be waived off. The state government has also clarified that the priority will be given to corporation banks first then to Public and commercial banks if the farmer has taken loan from more than one bank. The candidate beneficiary has to be the citizen of the state of Punjab by birth and should have all valid documents to prove his resident-ship. For marginal farmers to be eligible should have below 2.5 acres of farm land and small farmers are eligible if they own between 2.5 to 5 acres of farm land under the scheme. It is certain that the state government of Punjab shall be setting up an online web portal to help farmers get registered under the scheme. To get registered candidates will have to log on to the official Punjab state government. If the farmer is eligible then he or she will be able to get registered using the online application form available on the web portal. To fill out the registration form the candidate will have to check with his or her eligibility status. Once the registration has been done then the farmer will have to wait for the notification from the relevant bank institution. Farmer needs to have a copy of birth certificate or school leaving certificate to prove his or her citizenship in the state. It is also obvious that he or she may have to submit a copy of Aadhar card / Voters card / Pan Card / Ration card as a proof of identification. The state farmer will have to provide with a copy of land ownership document when registering. A certificate copy of the Debt relief from the relevant financial institution stating the amount to be waived off under the scheme. Farmers have to provide bank passbook copy that is Aadhar card linked so the waived off amount can be credited to that bank account. It is certain that under the scheme the state government will cover the loan disbursement one the basis of commercial banks wise and lending institutions including rural banks and urban cooperative banks. The state government will conduct a bankers meeting at the district level under deputy commissioner supervision to prepare a complete list bank wise loan waiver amount. The list will then be sorted farmer wise and then be forwarded to the Director of Agriculture. The loan waiver amount will then be released to the Deputy Commissioner that shall be credited to the farmer bank account. It is certain that according to the priority basis the loan waiver amount will first be settled for marginal farmers and then for small farmers. According to the latest stats it is certain that an overall crop loan amount due on farmers in the state is about Rs 59,621 crore till March 2017. It is also certain that with the implementation the state government will have an additional debt of Rs 400 crore. Today, Loan waiver certificates have been distributed to some beneficiaries. First phase has been implemented in Mansa, Bathinda, Faridkot, Muktsar and Moga districts. It is also said that, nearly 47 thousand farmers would be benefited by the scheme. According to latest updates from the Punjab, the state government has taken initiative by introducing self declaration system for land holdings within the state. This step has been taken by the government to ensure benefit under the scheme will only be offered to the eligible farmer of the state. According to further updates, the beneficiaries list will elude retired pensioners and other government employees from taking any further benefit under the scheme. With this in mind the government aims that only poor people and economic weaker section of the society get the benefit. So to make it effective the farmers of the state will have to provide with complete details of their land holdings.